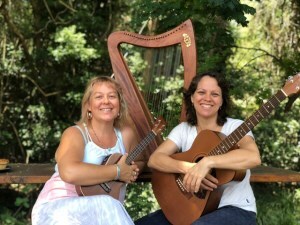 Name: Caroline Hammond and Kate B.
Caroline & Kate join harmonic forces for this offering of melodic stories and uplifting music. Here you will find words of insight & peace that float in contemplation, songs to uplift the heart, songs to be still and rest amongst & songs to slow dance & groove to. With collectively 4 solo albums (soon to be 6! ), this is bound to be a musical adventure to remember.